PIMCO is the world’s largest bond investor with over $1 Trillion under management (yes that’s Trillion with a T). The firm was founded by Bill Gross, who still works as Co-Chief Investment officer alongside Mohamed El-Erian, who is also the firm’s CEO. While PIMCO does have other types of funds, their primary speciality is bonds, so we have lots of information on PIMCO Funds here at Learn Bonds. The PIMCO Total Return Fund LB Rating – With over $200 Billion under management the PIMCO Total Return fund is not only the largest bond fund in the world, its the largest mutual fund in the world period. Here is our rating of the fund for those considering investing. The PIMCO BOND Total Return ETF – In March of this year the ETF version of the popular Total Return Fund was added to the PIMCO Funds lineup. Here’s an overview of the Total Return Fund vs. the Total Return ETF. PIMCO Real Returns Fund – Although this fund is presented as an inflation protector, in our opinion there are better PIMCO Funds out there for inflation fighting, like the ones we outline in the below article. 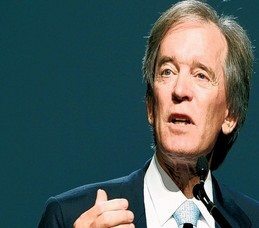 One of the great things about PIMCO, is that Bill Gross is very open with his investment philosophy and current market views. Each week the staff here at Learn Bonds covers all the investment ideas and market thoughts from Bill Gross and Mohamed El Erian. Here is some of the latest coverage. On the US Fiscal Situation, The FED, and Gold – Here we discuss the latest commentary from managers of some of the largest of the PIMCO Funds Bill Gross, Mohamed El Erian, Mihir Worah, Nicolas Johnson. Bill Gross is Bullish on Muni’s – In this article we discuss why Bill Gross likes municipal bonds and is bearish on treasuries. Bill Gross is Betting on Mexico – Bill Gross likes Mexican government bonds, here’s why. You can find more commentary and information on PIMCO Funds here.